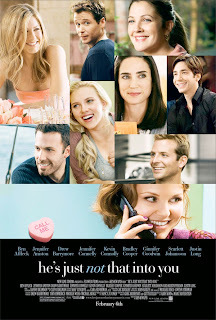 Okay, I cheated, but I just couldn't resist re-watching He's Just Not That Into You (2009). This movie has been one of those movies which I watch over and over, whenever I need a little, um, advice. The cast is huge: Jennifer Aniston, Ben Affleck, Ginnifer Goodwin, Scarlett Johansson, Bradley Cooper, Jennifer Connelly, Justin Long, Kevin Connolly and Drew Barrymore. Throw in renowned romantic comedy director Ken Kwapis, and we have a winner. I'm not going to attempt to try and explain all of the plots and sub-plots, because there are so many stories in this film that all relate to one thing: to be loved and not to be loved. Despite what people might say, the main character is Gigi (played lovably by Goodwin, who is so under-rated), who is desperate to have a boyfriend but just can't find the one. The great thing is, is that the 'one' is standing right under her nose and she didn't know it...at first. We follow many inter-locking stories, which involve some great characters played by the many stars. But by the end, we all learn a valuable life lesson: you have to know who's the right person for you, and not just judge it by the 'signs'. Some scenes are funny (like the scene where Gigi leaves a message on Connor's answering machine); others are heart-breaking (mostly the infidelities in Ben and Janine's marriage); and others you just have to cringe at (like when Mary recieves some unexpected messages on her phone). It's cute, funny, sad, or basically everything that romantic comedies of today don't have. This movie truly is one of a kind.